Brighton and Hove News » Could you be a snail trail guide? Martlets is looking for volunteers to help guide people around the Snailspace trail this autumn. 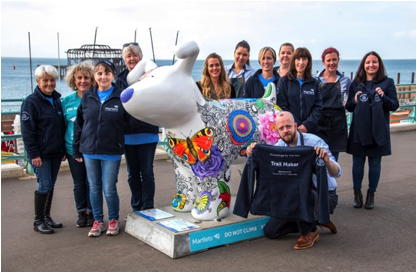 Following on from the success of Martlets Snowdogs by the Sea, this Autumn 50 giant and 50 junior Snail Sculptures will slide onto Brighton and Hove streets to create the city’s biggest visitor attraction of the year. The hospice is looking for Route Masters to help visitors find their way around the trail and direct them to key destinations on the route map. This may involve showing them how to download the Snailspace App, talking about the sculptures, helping with ‘Snailfies’ and much more! At times you may also be asked to collect money for the Martlets. The Route Masters will volunteer in pairs and work 4-hour shifts from 11am until 3pm. If involved you will be required to volunteer from 9 September to 4 December, Thursday – Sunday. The Martlets will offer training, a snazzy uniform (fleece, hat and badge), refreshments and full support from Martlets staff. Reasonable travel expenses will be covered and volunteers will be working in pairs to ensure everyone’s safety and wellbeing.